When android was launched, we have no idea that we will be able to automate tasks. Yeah! now a days apps like Tasker are quite more popular. This post is based upon a Tasker alternative app called Macrodroid brought to you by AirloSoft ltd. Macrodroid is an app which can be used to perform automated tasks in android. 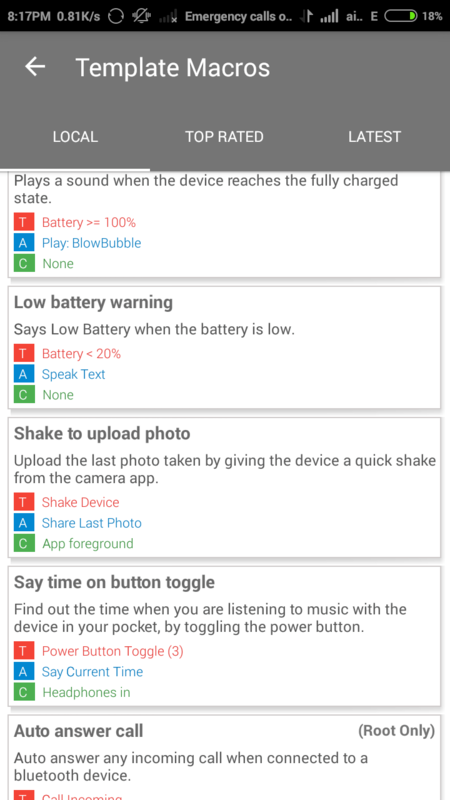 Well still Tasker is best app to automate tasks on android but it is not easier to understand and Tasker is complicated. that’s why we have best alternative to perform automated tasks on android. Macrodroid have easy to use user interface which helps in automating common tasks in android. Macrodroid is available for free on Playstore but free version can only perform 5 automated tasks, if you want to automate more tasks, you need to install Pro version which costs about $2.99 . I hope you installed Macrodroid. Now it’s time to fire up macrodroid and check it out it’s easy to use and simple interface. To automate tasks on your Android you need to create a new macro which will initiate automated tasks. 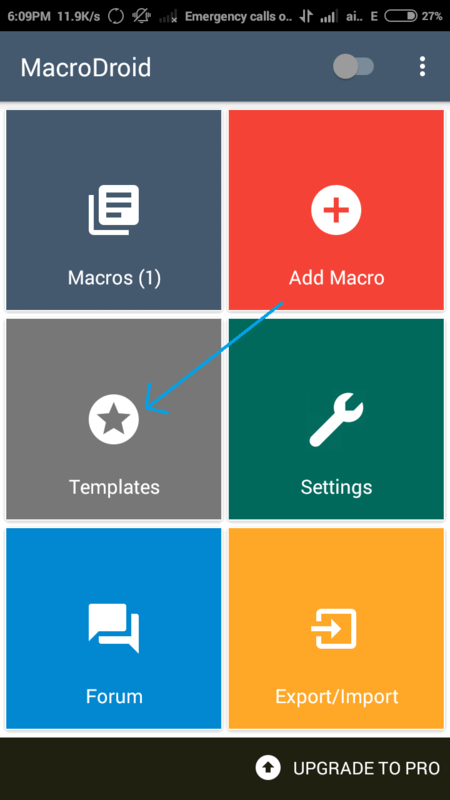 Simply tap upon “Add Macro” button. Now you’ll be asked for Select a trigger. Trigger is a event which will initiate the action which you want to be done automatically. After selecting a trigger you’ll be asked to choose an action. You can simply select a action from list which will be executed automatically. You can add one action or set of actions according to your need. 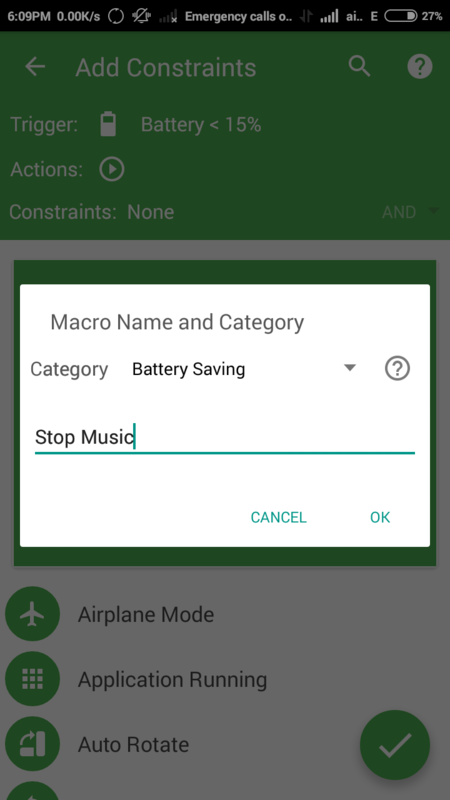 I am choosing “Play/Stop Sound” from list. Macro will stop all kind of existing/playing sound automatically when my device battery will be less then 15%. Next you will be prompted to select an Constraint. This option is completely optional so i am avoiding it. Constraints can be used to allow or prevent a macro from running based on certain conditions. A macro will run if the constraint conditions is true. if you are done click on right tick at bottom right corner in screen. 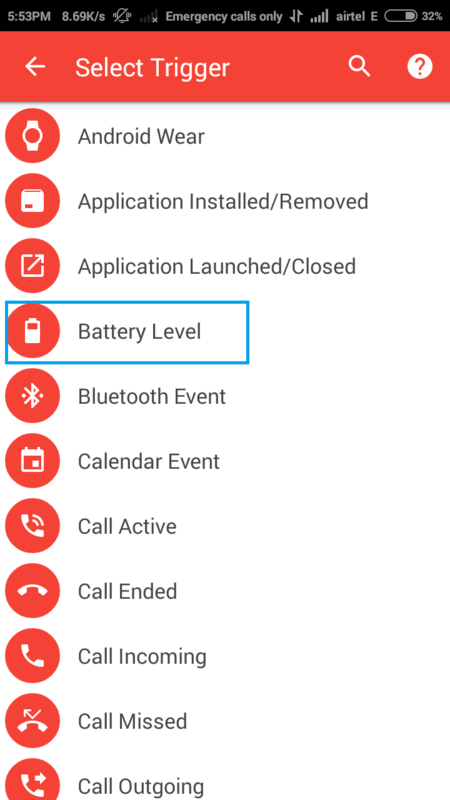 Next you’ll be asked to add a name to your Macro and select a Category.Here i am choosing category “Battery Saving”. You are done now . Make sure to enable Macrodroid checking in app at top right corner in screen. Now you’ve nothing to do, sit back and you can exit macrodroid. You can simply use your android. Your action will be automatically executed when it will be triggered. Sometimes you need to perform a job which is very common. Same like it, Developer added some common macros in Templates which can be useful to you. You can simply select a template which will save your time. Editor’s Desk – Macrodroid have 100k + downloads. Techies and Geeks loves this kind of apps. You can work beyond limits and Such apps like Macrodroid enhance your android’s capabilities. It’s time to automate tasks ,download and install Macrodroid. macrodroid defenitely wins over other device automation apps.